It’s time for the new school year to begin, and your kids rooms might be a little worse for the wear of a summer at home. Fortunately, a little paint goes a long way toward interior design in any space. You could choose an interesting wall color and leave it at that, but there are so many ways to be creative in a kid’s room, regardless of their age. And the best part is that when you grow tired of it and want another new look, all it takes is another coat of paint. Blades of grass are as tall as trees, and butterflies and other creatures have friendly faces. Give this type of decor a multi-dimensional appearance by mounting oversize leaves on the wall. 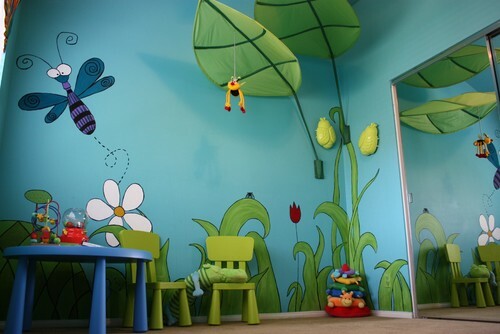 When the design covers every wall, your child is immersed in fantasy whenever he or she is in the room. There’s no denying it, most kids have written on the walls at one time or another. Imagine their surprise when scribbling isn’t just acceptable, but encouraged! 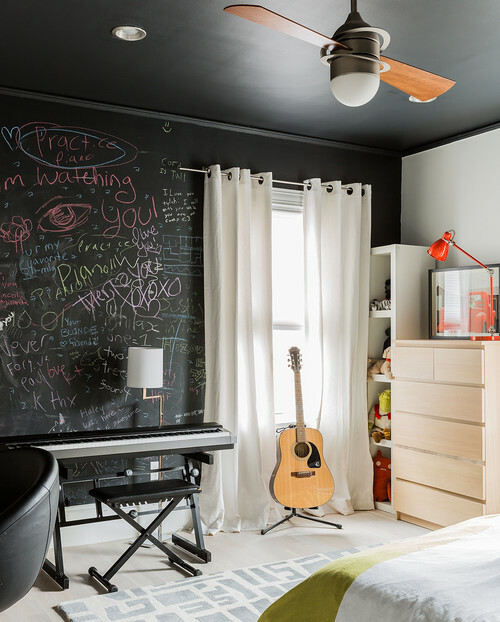 Chalkboard walls give kids a renewable surface for artistic designs. They can draw, write notes, and even solve homework problems. And when it’s time for a new look, all you have to do is wipe it down with an eraser. You can buy chalkboard paint pre-mixed and ready to roll on. All you need is a smooth surface, and you can turn a plain wall into one where they can create to their heart’s desire. Most kids have at least one period where outer space is the most fascinating thing. 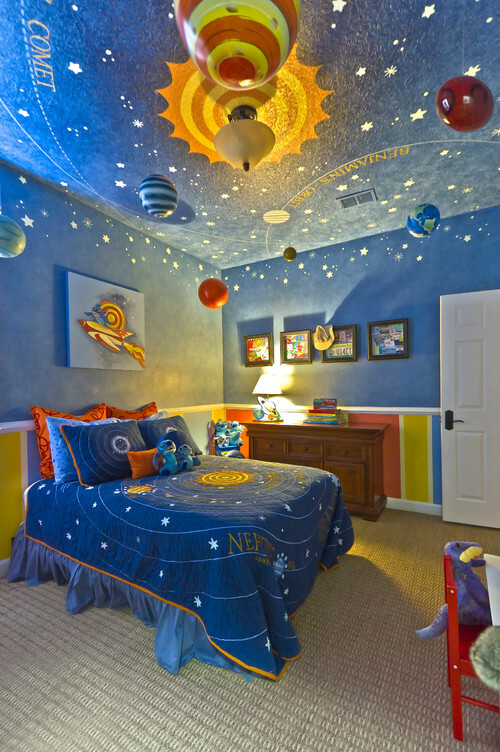 With that as your inspiration, you can paint the ceiling or the whole room to mimic any galaxy you like. Start with a deep blue background, and then build up with whichever elements you want to include. Stencils make the job easier, as you can simply tap on paint and reveal perfect stars, planets, and other celestial bodies. To make the decor more realistic, add a three-dimensional look with planets and even space ships suspended from the ceiling. There’s little artistic skill needed to create a fun, colorful room with an array of large polka dots on the walls. Paint the room in a solid color, and then use any circular item, such as a dinner plate, to trace random circles anywhere you like. All that’s left to do is fill in the circles with a complementary or contrasting color. To make it easier, use circle stencils and fill them in with other stenciled patterns such as lace, zebra stripes, or more dots. Save the stencils because you might need to cover up damage to the walls later, and no one will ever know what's hiding behind a dot. If you want a symmetrical appearance, lightly trace a grid guide on the wall using a yardstick and a level. For a more random design, place the dots anywhere you like, even overlapping a few. The great thing about paint is that it’s an economical way to create a dramatic effect. And after a season of kids spending a lot of time at home, a fresh new look could make everyone happy. Why not try your hand at making something creative and fun in your kid’s room? If you’re not artistic at all, not to worry. There are lots of stencils available online like MyWonderfulWalls.com or craft stores that take away all of the guesswork involved in making beautiful designs that you and your kids will love.